PLEASE NOTE: This Retreat is for Oregon Youth only! 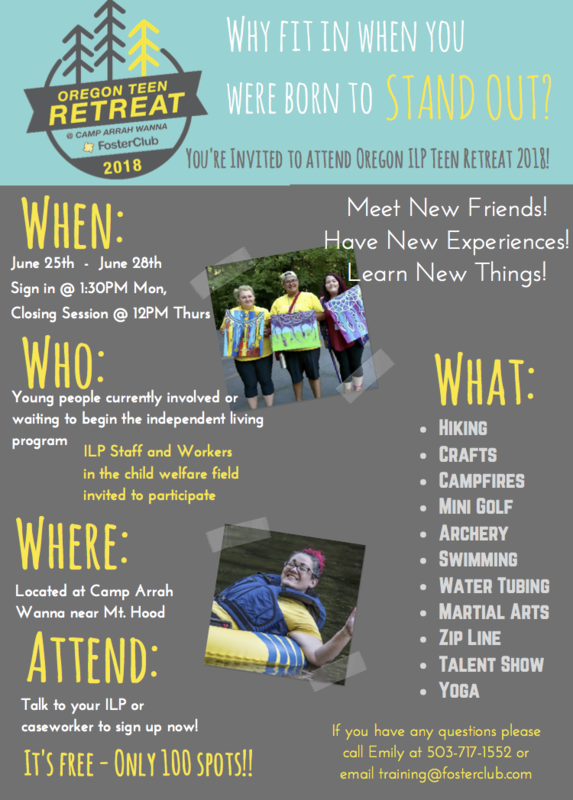 Join us for an amazing Oregon Teen Retreat, where we'll empower young people to embrace differences and cultivate respect! Our action-packed agenda incorporates team building, stress management, wellness and recreational activities. Participants will leave with new tools for health, a restored sense of self, and an increased capacity to respect others across culture, race, ethnicity, religion, capability, and gender identity and expression. Youth will leave inspired (and ready to inspire) with the courage to STAND OUT! ATTENTION: Applications need to be completed and turned in by June 8th, 2018! Workshop Descriptions - Stay tuned for more information!